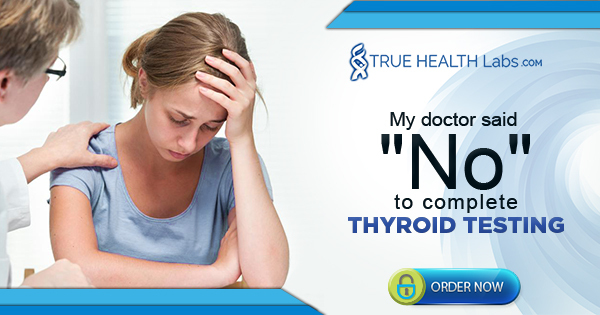 Lab tests help to identify the thyroid problem and make necessary changes to restore the thyroid function. Evaluation of the symptoms combined with appropriate lab testing is the best approach to make a diagnosis. has associated health conditions such as PCOS, celiac disease, dermatitis herpetiformis, different types of anemia, hepatitis C, type I and II diabetes among others. Conventional medicine relies on the blood test for TSH or a combination of TSH (thyroid stimulating hormone) and total T4 thyroid hormone for a diagnosis and treatment of hypothyroidism. Due to the wide range of the normal test results which also varies from lab to lab, many people remain undiagnosed or undertreated. In addition, TSH and T4 tests are used for screening of hypothyroidism but they are not intended for diagnosing autoimmune Hashimoto’s disease. It takes time for Hashimoto’s to develop and progress to subclinical hypothyroidism and a full-blown hypothyroidism that can be clinically detectable using standard thyroid tests. Currently, there are about 22 types of thyroid dysfunctions that can result in low thyroid function. Most of them could not be diagnosed by using TSH test alone. To get accurate evaluation of your thyroid function more advanced blood tests are required. Basic thyroid panel is a useful tool to screen for hypo and hyperthyroidism. This is a thyroid blood test that is designed to measure total T4, free T4, TSH and T3 uptake by the thyroid gland. The pituitary gland produces TSH to stimulate the thyroid to release T4 and T3 hormones. In hypothyroidism TSH is increased or normal, T4 is low or normal and T3 is low. T3 uptake estimates how much thyroid hormone-binding proteins are available in the blood. Free T4 represents unbound thyroid hormone which is available for uptake by cells and conversion into an active form of T3 hormone. Extended Hashimoto’s thyroid panel is a blood test for Hashimoto’s disease which is a main cause of hypothyroidism in the Western countries. Presence of thyroid antibodies is one of the indicators of increased thyroid autoimmunity and Hashimoto’s disease. Reverse T3 or rT3 is a metabolically inactive thyroid hormone. In the times of stress the conversion of T4 into T3 becomes suppressed. More thyroid hormone converts into reverse T3 causing the hypothyroid symptoms to arise despite the normal standard lab test results. Thyroid binding Globulin (TBG) binds T4 making less amounts of the hormone available leading to hypothyroid symptoms. The activity of the TBG could be increased in women on birth control pills, hormone replacement therapy, during pregnancy, those with liver diseases, genetic predisposition and those who take the drugs tamoxifen or perphenazine. Comprehensive thyroid panel is a blood test designed to evaluate TSH, free T3 and free T4, Tga and TPO thyroid antibodies and reverse T3. Measurement of free T4 and T3 provides more accurate information about hormonal status of patient than total T4 and T3 (bound and unbound) especially for those who are on estrogen replacement therapy or birth control pills, have impaired thyroid hormone conversion and show unresolved symptoms of underactive thyroid. All thyroid blood tests mentioned above do not require fasting. Why get tested at the True Health Labs? True Health LabsTM is the leader in direct access online blood tests that provides patients with fast, easy and reliable laboratory testing at discounts up to 80%. You could conveniently order you tests online without participation of your doctor and insurance. The lab sends your test results directly to you. The lab uses functional TSH normal range for evaluation of your thyroid function and you can get a free complimentary test results explanation to ensure your first steps towards the normal thyroid levels. If you do not know where to start you could ask for help and One-on-one test results review with a doctor at the True Health Labs. Some lab tests come with a free results explanation. One of their doctors can help you to pick the right test(s) and supply you with a List of doctors the Labs recommend. In the post Autoimmune Disease – 3 Secret Blood Tests Dr. Brady Hurst talks about specific functional laboratory testing for autoimmune diseases that can provide information about the individual’s unique immune system and its imbalance. P.S. If your doctor doesn’t know about or refuses to order extended thyroid panel, the easiest way to have your blood work done and get the answers is to get tested at a private holistic lab. The best part is you don’t need doctors’s referral or medical insurance and can even order your lab results explanation by a holistic doctor from the lab. So, instead of going from one doctor to another, hope that you get the right tests ordered and waste years of your life suffering, you can actually shortcut this exhausting and frustrating process by ordering thyroid tests yourself. This step alone often helps to discover much faster what you don’t know about your thyroid yet and what factors potentially limit your recovery from hypothyroidism and Hashimoto’s. Most importantly it can help to shift your thyroid treatment focus to where it should be in order to become hypothyroid and autoimmune symptom-free. If it’s something you need and are willing to do, the lab I recommend for thyroid and autoimmune testing is offering 10% off on all lab testing starting now until midnight of September 3rd, 2018. This is a generous discount on top of all other savings they already offer to begin with and compared to other labs. Remember that to make 2018 your thyroid treatment breakthrough year consider starting with a proper thyroid testing and learn why your thyroid is out of balance before you do anything else.